A very long time ago, there was a red-headed woman named Millie who had a tiny cafe near the theater in Lafayette. She officially opened at 5 am, but got to work about 2:30 in the morning to get ready. If she knew you, or if you were in a uniform like the police, fire department or tow truck drivers, she would let you in. I was a 20-year-old kid who drove a truck for the 76 station in Orinda who liked eggs and potatoes late at night–so I knew Millie. Years passed. Millie moved to her own building, but kept the same hours. Only now the door was locked until official opening time. Her cafe had a front room and a back room–and all the important business in Lafayette was conducted in that back room in the early morning. There was a huge brass cash register, and regular customers would ring in their own checks, pay the bill and make their own change. Decades passed. Millie retired, somebody else owns the joint now, but things haven’t changed much. Same hours, new cash register. Customers don’t use the cash register anymore. The eggs and potatoes are still great. I think the eggs should all be smooshed into the spuds. Lots of grape jelly on the toast. I felt like taking Gail to breakfast a few days ago, and there is still no better place to enjoy a classic American breakfast than Millies. Low-brow upscale. Or high class food for the hoi polloi. Hard to tell the difference. Just walking into Millie’s will make your arteries harden. 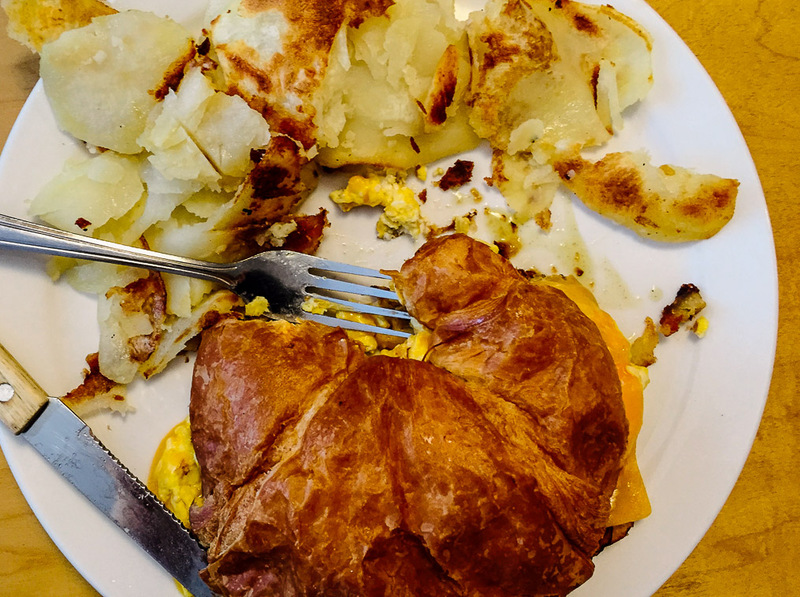 The place is a monument to butter, eggs and bacon fat. The coffee cake, heated in the oven and dripping butter, is legendary. The coffee is hot and strong, the OJ is fresh, the pancakes thick. The dress code is anything legal. I write about a lot of very fancy, hoity-toity restaurants with chefs straight from culinary school. Millie’s doesn’t have a chef, it has cooks, who can sling a half-dozen plates of eggs at a time and get them all just right. The waitresses are brash and friendly, fast on their feet and quick of wit. 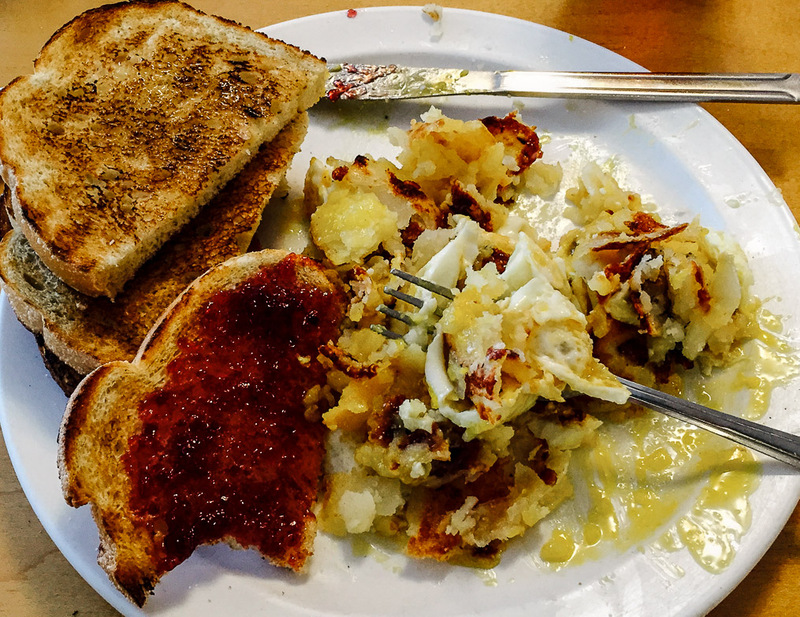 Millie’s is a classic diner, the best place in the county for a quick, hot breakfast or lunch without pretension, flash or glitz. It’s been that way for 40 years, and I hope it lasts another 40. My daughter took me there when she was a student at St Mary’s and I loved it! we used to go there with my husbands family. they loved it and so did I!